CARE is committed to responding to humanitarian crises in such a way that it has the greatest, longest-lasting impact on the lives of those people affected. This commitment is enshrined in its Global Programme Strategy (CARE 2020) and Humanitarian and Emergency Strategy (2013-2020; HES). CARE’s Humanitarian Accountability Framework (HAF, see section 3 below) sets out how accountability is a constant, guiding principle in CARE’s humanitarian work which, when applied at every stage of the programme cycle, provides an essential means of achieving high programme quality standards and greatest impact. For CARE accountability is not an add-on but is integral to every aspect of its work and the responsibility of every CARE staff member. Having a HAF as a core policy commitment means making decisions, managing performance and measuring success in an accountable way. It means that transparency, engagement and empowerment are built-in features of good quality humanitarian programme management. This chapter is intended to guide CARE staff, particularly those in Country Offices who are engaged in humanitarian programming, in the application of CARE’s HAF. CARE publicly recognizes its obligation to give voice to and be held to account by all stakeholders, not least the people affected by humanitarian crises, its implementing partners and its staff. CARE also understands that careful application of accountability standards improves the quality and relevance and enhances the positive impact of its humanitarian programming. With its membership of the Core Humanitarian Standard (CHS) Alliance, CARE makes a public commitment to uphold and promote global standards of quality and accountability that have been set and agreed by leading humanitarian actors including CARE. This chapter provides also the quality and accountability framework required of each full member of the CHS-Alliance. Programme quality when responding to humanitarian crises means addressing immediate needs in an appropriate, effective and timely manner. CARE has developed Global Outcome Indicators for humanitarian programmes that define ‘quality and lifesaving assistance’ as called for in the CARE Program Strategy. Further detailed definitions of quality humanitarian assistance are provided by SPHERE and its companion standards (see Humanitarian Standards Partnership). Good quality cannot be achieved without accountability. Only when people whose lives are affected by crisis are meaningfully engaged in programme design, delivery and review will their needs be met and will they be supported by CARE to become empowered, less exposed to risk and more resilient in the long-term. Accountability is the responsible exercise of power and therefore must be a built-in feature of an agile response management practice: how decisions are made in a response, how performance of a response is managed, and how success of a response is defined and measured. CARE must be accountable from top to bottom, bottom to top, inside and out, and to every stakeholder. Most important of all, the decisions CARE makes at every stage of a humanitarian crisis must be determined by the needs, concerns and interests the women, men, girls and boys whose lives are affected. CARE must make those decisions in the spirt of openness and transparency and be accountable for their impact. With this firm commitment CARE aligns itself with the IASC Commitments on Accountability to Affected People (CAAP). CARE is committed to a wide range of internal and interagency policies and standards. Central to these standards and policies is our commitment to being directly accountable for the quality of our work by making certain that communities affected by disasters have a say in planning, implementing and judging CARE’s response. However, the large number of different standards and accountability initiatives can be confusing. is a policy statement and framework on quality and accountability for CARE’s humanitarian mandate. It sets out how accountability is a constant, guiding principle in CARE’s humanitarian work which, when applied at every stage of the programme cycle, provides an essential means of achieving high programme quality standards and greatest impact. All CARE staff and offices should understand and comply with the HAF in the design, delivery and review of humanitarian programming. Compliance requires meaningful engagement with and the empowerment of people affected by crisis, partners and CARE staff. The HAF, as such, prescribes a culture of transparency and learning to drive real-time and long-term improvements in CARE’s responses to humanitarian crises. The HAF is also a vehicle for bringing CARE together in focus, coherence and consistency to achieve high quality, accountable humanitarian programming across the globe. For more information about the contnt of the HAF see also the HAF 2016 presentation in the Annexes. 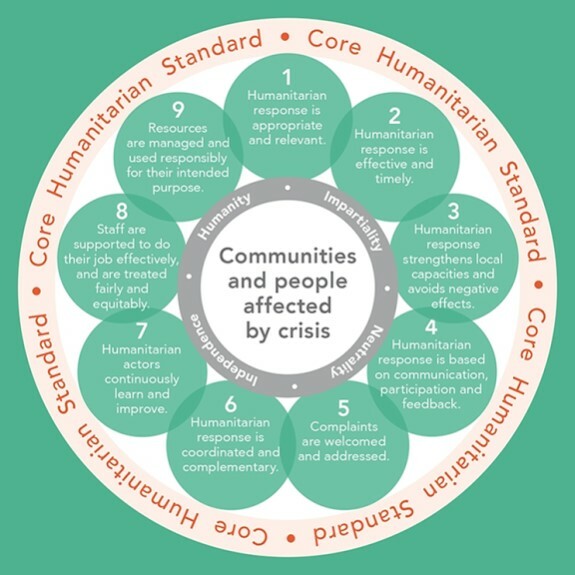 The nine Commitments on Humanitarian Quality and Accountability included in CARE’s Humanitarian and Accountability Framework (HAF) are in principle the same set out in the Core Humanitarian Standard (CHS). They replace the Benchmarks of the 2010 HAF. All humanitarian programme monitoring and evaluation is part of CARE’s commitment to accountability and connected to CARE’s HAF Accountability System. The HAF Accountability System is designed to monitor how well CARE performs against both its Humanitarian Quality and Accountability Commitments and its Humanitarian Performance Targets within each emergency response. Furthermore, the system allows individual response performances to be compared with one another, across the globe and over time. CARE’s Programme Information and Impact Reporting System (PIIRS) and the CHS verification process will support the synthesis and analysis of CARE’s organization wide performance against HAF targets and commitments which will be summarized and presented in the annual Humanitarian Performance Metrics reports. Monitoring, RAR and AAR outputs as well as the RPS are shared internally within CARE through the Crisis Coordination Group and ERWG in order to allow for immediate management response action. Core data from these sources are also stored in CARE’s database for humanitarian crisis and responses. The database is currently under construction and will ultimately allow the visualization of real time performance data for all stakeholders in CARE for enhanced management efficiency, transparency and mutual accountability. Humanitarian Performance Metrics reports are compiled each year for the CARE International Senior Leadership Team (Humanitarian & Operations). All Performance Metrics reports, evaluation reports and CHS verification outputs are, for the sake of accountability, shared via CARE’s International’s Electronic Evaluation Library (EEL). Synthesized results of the CHS verifications will be made public together with the related improvement plans as required by the statutes of the CHS Alliance. The report of a met-analysis in 2016 of CARE’s humanitarian work against CHS commitments together with an initial scorecard using the CHS quality criteria and indicators can be found in the CHS folder on Minerva. For fuller guidance on all monitoring and evaluation, please refer to chapter 9 of this toolkit which also includes a section on Accountability Monitoring (incl. Rapid Accountability Reviews – RAR). For AAR reports, Performance Metrics reports and other useful documents, please refer to the Annexes in this chapter. Compliance with CARE’s Humanitarian Accountability Framework (HAF) is a CARE-wide obligation and priority. It is the responsibility of every CARE staff member to treat quality and accountability (Q&A) as integral to his or her role. All CARE Country Offices and CARE Members should have plans in place for operationalization the HAF in their particular context and for relevant monitoring its implementation. – alongside CEG REC and MEAC, maintain oversight over HAF performance measurement processes within a particular response (primarily RARs, AARs, evaluations). The CARE Emergency Group (CEG) maintains oversight of CARE’s humanitarian Q&A performance – including leadership on Rapid Accountability Reviews (RAR), Response Performance Summaries, Core Humanitarian Standard (CHS) Verification, Humanitarian Performance Metrics. The Country Office (CO) must ensure that there is sufficient staff capacity and financial resource to support implementation of CARE’s Humanitarian Accountability Framework (HAF) from the outset of any emergency response. As far as possible costs for staffing (including training, salaries and other costs) and specific activities (including communications and any relevant monitoring or learning activities) should be included in donor-funded project budgets. The CARE Emergency Group (CEG) and all CARE Members must also have adequate resources for quality and accountability in place for activities such as HAF training; supporting RARs; participating, supporting or leading (CARE members: Type 2; CEG: Type 4) AARs and other accountability-related processes; and engagement in inter-agency networks, not least the Core Humanitarian Standard (CHS) Alliance.